Our church supports several different feeding ministries. 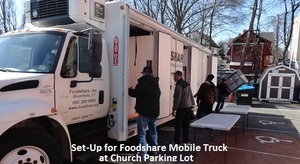 Every other week, the Foodshare Mobile Truck is in our parking lot to distribute fresh produce. Loaves and Fishes supplies hot meals to Hartford’s hungry at a location on Woodland Street. The South Park Inn, for which we periodically prepare food, serves hot meals to homeless people in downtown Hartford. And on the second Sunday of each month, we serve a free Community Breakfast at the church. Your support of these programs financially, and your volunteer service, are essential to their success. Giving to our overall Feeding Ministries allows us to allocate the money to whichever program is most in need at the time. To learn more please speak with Pastor Taylor or Hunger Coordinator Galen Starling. Or if you would like to make a donation, you can use the Donate button below, and indicate Feeding Ministries in the comment line as you make your contribution.